Update: Opening night of "Waikiki Nei" has been pushed back to July 22. 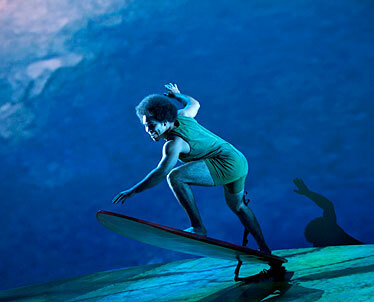 Jonathan "iNTRiPiD" Sypert catches a wave on the stage of the new Waikiki showroom production, "Waikiki Nei." Sypert's segment demonstrates the high-tech nature of the show, as a portion of the stage lifts and rotates to mimic the action of a wave. The wait - the countdown to show time, if you will - is almost over. After weeks of rumors, hype and anticipation, "Waikiki Nei" officially opens tomorrow. The show, the newest and biggest entertainment project by veteran impresario Roy Tokujo, is also the biggest and most elaborate show ever presented in Waikiki - and it's already part of local entertainment lore. For instance, who hasn't heard about Tokujo's $22 million investment in gutting and rebuilding the long-vacant space formerly known as the Aloha Showroom? Or about how everything was designed and built in Montreal, then taken apart, shipped to Hawaii and reassembled? What about Tokujo's decision to raise the ceiling 30 feet to accommodate lights and other gear? Or about the hole he had cut in one of the walls to get all that stuff inside? » Coming up: For a review of "Hawaii Nei" and a preview of the Level4 Nightclub and Ultra Lounge, see this week's HiLife section. "Wow effect" is the term he uses to describe the show and his multiuse concept for the space. The "Waikiki Nei" showroom converts into the equally high-tech Level4 Nightclub and Ultra Lounge; it will also be available for use as a meeting space during the day. Tokujo is counting on the "wow," and on the "sizzle" of being Waikiki's first significant new attraction in years, to overcome the challenges of opening a big-budget show when the local economy is soft and visitor numbers shaky. In the long term, he says, economic conditions will improve and visitor numbers will rebound. In the short term, "Waikiki Nei" is a fresh attraction for visitors and residents alike. Tokujo knows what works in Hawaii and how to present it. He put large-scale magic on the Waikiki entertainment map when he launched John Hirokawa's "Magic of Polynesia" at the Hilton Hawaiian Village Dome. He then gave Hawaiian-theme entertainment a radical spin on Maui with "Ulalena," a look at Hawaiian history from a Cirque du Soleil perspective. There are Cirque du Soleil elements in "Waikiki Nei" as well, but this isn't "Cirque Goes Hawaiian" with, say, contortionist troupes and high-wire acrobats tricked out in Hawaiian prints and hula skirts. Hula, yes. European-style specialty acts, no. Local buzz has been building since Invitation-only performances began last week. Many in the audience on Thursday were from Japan, and they gave the cast and crew a standing ovation at the finale. 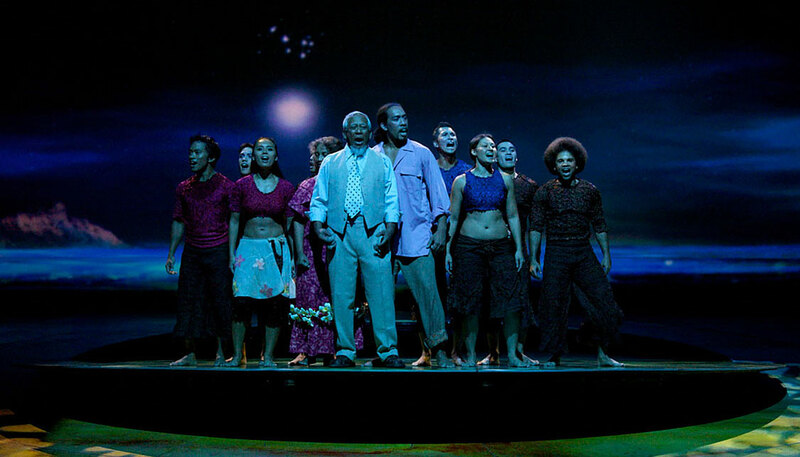 A dramatic highlight that night came when cast member Jonathan "iNTRiPiD" Sypert "caught" and rode an impressively large and realistic wave center stage (Hawaii residents will also recognize veteran stage actor Moses Goods III and Reb Beau Allen on stage; Goods plays one of the Hawaiians, Allen a visitor). 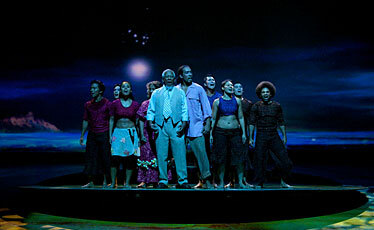 The production has a carefully calibrated Hawaiian sense of place, with choreography by Peter Rockford Espiritu. At the same time, it offers Vegas-caliber production values. But the show is definitely rooted in Hawaii, and there's little danger that anyone seeing it will mistake it for a Las Vegas production, Tokujo said. "You can't see this show there."